Over the last few years, the Star Wars community has experienced a major divide - what's causing it? By the time you read this, Solo: A Star Wars Story will have been released. It is the fourth Disney-era Star Wars movie, the fourth written by Lawrence Kasdan, and the first directed by Lucasfilm alum Ron Howard. That should indicate that the fan reaction would be relatively positive, right? Well, not exactly. It's one thing to question why the story of a young Han Solo should be made into a movie, but there is a small but very vocal side of the fandom that just rejects any of the Disney productions out of hand, and will make it very clear that you shouldn't like them if you're a “real fan.” I feel there is too much of a divide in the Star Wars community, not unlike the political division we see now in the country. Of course varying points of view are nothing new to the Star Wars fan community, a toxicity in it has become a very visible aspect. At the core, the series appeals to all generations – so what's the problem with the new generation having “their” Star Wars? 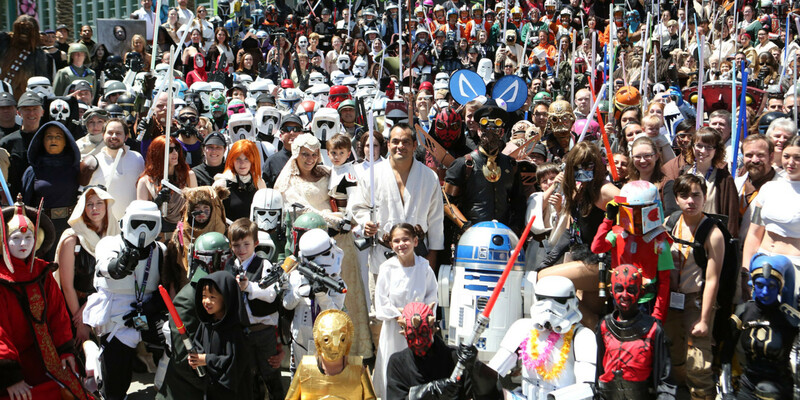 When the Prequel Trilogy started in 1999 with the release of The Phantom Menace, fans were split. Some liked the movie, others hated it, and in time, it became more hated than loved. Which is fair, it has its share of problems – namely, Jar Jar Binks. Attack of the Clones had a similar effect on the fans, though it is usually considered better than the previous one. This film also spawned several memes and jokes in time, focusing on the dialogue that wasn't exactly natural. In 2005, the final installment in the trilogy was released, titled Revenge of the Sith. Unlike the previous two, fans generally considered Episode III the best of the prequels, and the memes were more in fun than in ridcule. However, over time, it became the norm to hate every single aspect of the Prequel Trilogy, like they were the absolute worst thing to happen to the world. The infamous RedLetterMedia reviews didn't do much to help this, going in and nitpicking the movies, trying to find issues with them. Eventually, their opinion became the only acceptable opinion, and anybody who liked the PT were looked down upon by the fandom. Not even the Original Trilogy was safe from fandom rage however. With every re-release since 1997, George Lucas added new scenes or re-did effects on the films, and fans generally dislike these “Special Editions.” Debates have been held on whether “Han Shot First” and much hate was thrown towards the changed ending to Return of the Jedi, where the Force Ghost of Anakin Skywalker, originally portrayed by Sebastian Shaw, was replaced with Hayden Christensen (who played the character in Attack of the Clones and Revenge of the Sith). The fandom had all but turned on Lucas, who repeatedly said he didn't want to make additional Star Wars films because all the fandom was doing was saying “what a terrible person” he is. Of course the entire fandom wasn't, but it's the vocal few that become the speakers for the whole. Fast forward to 2012, and the sale of Lucasfilm to Disney was announced, along with new movies in the series being developed. Almost immediately, fans were divided. Some felt there shouldn't be more Star Wars movies at all, and the books/video games/etc were good enough to continue the story, while others were looking forward to them, though there was a slight bit of fear that the films would be closer to say, the MCU or a “safe” Disney film than Star Wars. And I'll admit, I was concerned these new movies might not be as good, but I never said Disney would ruin the franchise. Two years later, we reached what I would consider the breaking point among the fandom. It was announced that the Expanded Universe, the title for the countless books, games, TV shows, anything that wasn't a movie or the 2008 CGI animated The Clone Wars series, would be ending and the new “Canon” would be completely unified. Groups started up, claiming the EU was the “real” Star Wars and the Canon would be “fan fiction,” that it didn't matter if the general audience didn't read thirty years worth of books, the new movies should follow the EU and if the average person doesn't understand it, that's fine because Star Wars movies need to be made for fans not for the audience as a whole. Because there is no quicker way for a franchise to die than to completely alienate the people who didn't keep up with the series because they don't have time to invest into it. And there's no shame at all in that, not everybody who likes Star Wars has to know everything about it. George Lucas himself didn't keep up with the EU, he didn't even consider it canon – his own drafts for the Sequel Trilogy were going off his own ideas, not following the books that were set after the OT. And for the record, the EU became too confusing and over the top for anyone to really follow - killing off Chewbacca for shock value, books that contradicted each other to sentient mountains (yes, Mount Sorrow was a thing), it's for the better that they unified canon and let those stories just end. Canon is more digestible, doesn't need twenty years of backstory for someone to pick up a book and read it. In the time between Rogue One and The Last Jedi, there was a massive divide in belief within America, and that trickled down into the fandom as well. When The Last Jedi came out in December 2017, it quickly became a matter of loving it or hating it. Personally, I enjoyed it, I'd even say it's my third favorite installment in the saga (fourth if we're counting Rogue One). But others did not – maybe half the fandom says its the worst movie in the saga. That it ruined the character of Luke Skywalker, that the story was so unlike the others, that it should be retconned and ignored because it ruined the franchise. But it's really no different than any other film in the series. Compare the difference between A New Hope and The Empire Strikes Back. The tones are different, characters are in completely different areas that we didn't see them develop into. I'd be lying if I said I don't mind the scenes on Canto Bight, that whole sequence could have been shorter. But the fans are not in charge, these are decisions made by people who have been producing and making movies for decades. It's become an “us vs. them” type fandom, where if you love The Last Jedi you're a terrible human being and not a real fan, whereas others say if you hate The Last Jedi you're a bigot and not a real fan. Nobody hates Star Wars more than Star Wars fans, it seems. Are there issues with the movie, yes. But almost every movie has them. The movie happened, it's canon, there's no way of changing that. This is a series where Anakin Skywalker destroyed a giant military command ship at nine years old. If you won't complain about that but you'll declare certain things in The Last Jedi as the worst moments in the franchise, you might need to re-watch the movies. The internet is filled with debate on the current state of the brand. Much critisim is put towards Disney and Kathleen Kennedy, the current CEO of Lucasfilm. An often-cited complaint is that Rey is a “Mary Sue,” a term meaning a character that can do no wrong and has no flaws, does everything perfectly. Kinda like Luke in A New Hope or Anakin in The Phantom Menace – you know, how a farmer can all of a sudden fly military-grade starships with ease. Or how “diverse” the newer films are by casting non-white actors in leading roles and introducing characters of different sexualities in the series, such as Rose Tico and Admiral Holdo in The Last Jedi. Jonathan Kasdan, co-writer of Solo, said in an interview that Lando Calrissian is pansexual, meaning he doesn't have a preface either way – and despite being backed up by his father and co-writer, Lawrence Kasdan, who also co-created Lando for The Empire Strikes Back, some fans online are claiming this is just Kennedy trying to “ruin” the brand. Even down to Kennedy wearing a shirt that said “The Force Is Female” on it, that's apparently destroying Star Wars as we know it. But it's just a shirt, George Lucas occasionally wore one that said “Han Shot First” despite being the guy who changed that. And in The Clone Wars series, the Light Side was represented by a female character known as The Daughter, but I digress. I personally don't agree with every decision Lucasfilm has made, but I'm not in charge of that. They know what they're doing, as does Disney. And despite outrage online, Disney has been able to recapture the public's love of the saga in a way rivaling the 1980s. Are there issues with the Sequel Trilogy, yes. But are they really the worst thing to ever happen to Star Wars? Far from it. The absolute worst thing was those Ewok TV movies from the mid-80s – at least the Holiday Special is so bad it's good, those are just unwatchable. Do I love Star Wars unconditionally? As a franchise, yeah you could say that. But there are things about the movies that I'm not a big fan of. I don't like Anakin Skywalker being a little kid and flirting with a teenage Padme Amidala in The Phantom Menace. I don't care for how R2-D2 is barely even in the Sequel Trilogy despite him being one of the most iconic characters from the series. Even The Empire Strikes Back, which is my absolute favorite movie of all time, has the issue of Luke Skywalker never getting lightsaber training, yet can fight Darth Vader for a good amount of time without issue. And yeah, I'm not sure if a Han Solo origin story is interesting enough to be a movie. But that's okay, I'm still seeing the movie opening night. At the core, and even George Lucas has said this, these movies are essentially made for kids. Of course it's not just kids that like the series, but it is that kid in our hearts that does. When I saw The Force Awakens, the crowd cheered when Han and Chewbacca came onboard the Millennium Falcon. For a decade, the only new content that was easy to get for the franchise was The Clone Wars television show. But now, kids are in an era where there is annual movie releases, TV shows, video games, books for all ages. To them, the Disney era is their Star Wars. Who cares if The Last Jedi isn't what "fans" wanted? This is how things are, generations change. Kids these days wouldn't care as much for a movie just like the OT. I know because at comic cons, kids are cosplaying characters like Rey, Kylo Ren, and even Sabine. When I was a kid, it was seeing Revenge of the Sith that made me want to make movies. And out there, there's another child who wants to be a filmmaker because of The Last Jedi. They are the new fans, they're the ones growing up with these characters. In time, when there's another movie in production, perhaps they won't let the divide continue.